Herbalists, as with any other profession, need to make a living from their craft. There are people who think herbal medicine and advice should be free or unsustainably low because herbalism is “the people’s medicine” and should be accessible to all, and others who seek to capitalize on a growing field. The rest are somewhere in the middle, hoping to support themselves and their family with their skill. Pricing goods and services isn’t easy. One must consider the time, labor, and resources that go into making a product, and come up with a price that is fair to the consumer and the business owner. What factors contribute to the price of a good or service? Why should one have comparable pricing with others in the field? How do we make goods affordable to those who need them, while simultaneously supporting ourselves? One might look at a product and say “that’s simple enough to make, why are they charging so much for something I can make myself for a lesser cost?” The truth is, it isn’t that simple. Anyone can get a recipe online and replicate the results, but that doesn’t mean they know what they’re doing, and it’s minimal work to merely follow someone else’s recipe instead of creating your own through research and experience. There are many factors that determine the cost of a good or service, but we mainly consider the time and labor involved to produce a good, the cost of materials and resources used to create it, and the expertise of the person who created the good. What might this look like in herbal medicine? Time and labor include the effort spent growing, tending, harvesting, and processing plants for remedies, time spent developing recipes and making products, ordering materials, designing labels and labeling goods, and taking product photos and creating online listings if the good is sold online. The cost of materials may include the cost of herbs, honey, oils, beeswax, containers, tools, and labels used in herbal goods like salves, syrups, and tinctures. Resources may include the cost of a printer to create labels, tools like a mortar and pestle to grind herbs into a powder, or jars for infusions or scales for weighing herbs in a recipe. When you buy a good or service from someone, you might consider the investment they made in their education to make them knowledgeable about what they do. This might include the hours and money they invested in classes, textbooks, and training. Other factors may include the price of certifications and licenses needed to produce and sell herbal goods in compliance with local, state, and federal laws. All of these factors are considered when determining the cost to produce a good, and its final price to the customer. Herbalists have their own recipes for their products and have different suppliers for some ingredients and materials based on their location. We may have different costs of running a business, or different education backgrounds. As such, not everyone has the same cost of production, and prices will vary among goods and services. However, there is usually an average cost for producing a good and thus an average cost to the consumer, and it is important to have pricing comparable to other businesses. By underpricing a good, a person lowers profit margins to a level that won’t support a business, and creates competition among other business owners. For example, if a product costs $4 per bottle to make and most people charge customers $10, but someone charges only $6, they’re creating competition by selling a good much lower than what others can afford to sell it at, and at a price that won’t support a business. But, if the business is not a person’s main income, they may only have lowers prices to increase sales and encourage people to turn to them for goods. Unfortunately, there are people who do this intentionally to make sales and capitalize on a popular product, often without having put in comparable work and resources than other individuals did to create it. However, if you overprice a good, you may turn people away, and not be fair to the consumer. As herbalists, we want to help others in the community and offer our goods and services regardless of one’s ability to pay for them. While it is not feasible to frequently give away goods and services at our own expense, we can offer Sliding Scale Pricing so that we are fairly paid for our efforts and investments, but can still offer our goods to those whom it would otherwise be a true financial hardship. Sliding Scale Pricing means that one offers variable pricing on goods and services that is based on a person’s income or ability to pay for a good or service. Someone who is wealthy would pay full price for a good or service, someone with a comfortable income might pay a bit less, and someone who may be at poverty level income pays a fraction of the full price. This is one way of ensuring that we make our goods more accessible to the public while allowing us to make a living. We can also exchange goods and services with others, which eliminates monetary exchange, or exchange goods and services in exchange for hands-on assistance in our apothecary. These are all great ways to help reach everyone in our communities. Herbalists, as with any other profession, need to make a living from their craft. We strive to make our goods and services accessible and affordable, while ensuring we are fairly compensated for our time, labor, and expertise. After all, we put a lot of love and labor into what we do! Tending the land and making safe and effective remedies doesn’t happen overnight, it’s the result of many hours of research and hands-on experience. There are so many factors one must consider when pricing a good or service, and we think not only of our own needs, but the needs of our community. If you’re a business owner in the herbal realm, I ask you to reflect on all it takes to produce the fruit of your labors, and whether you are fair to yourself and the consumer when pricing a good or service. Some of us may feel we don’t ask for enough in exchange for our work, and others ask too much, but it’s all about finding balance. 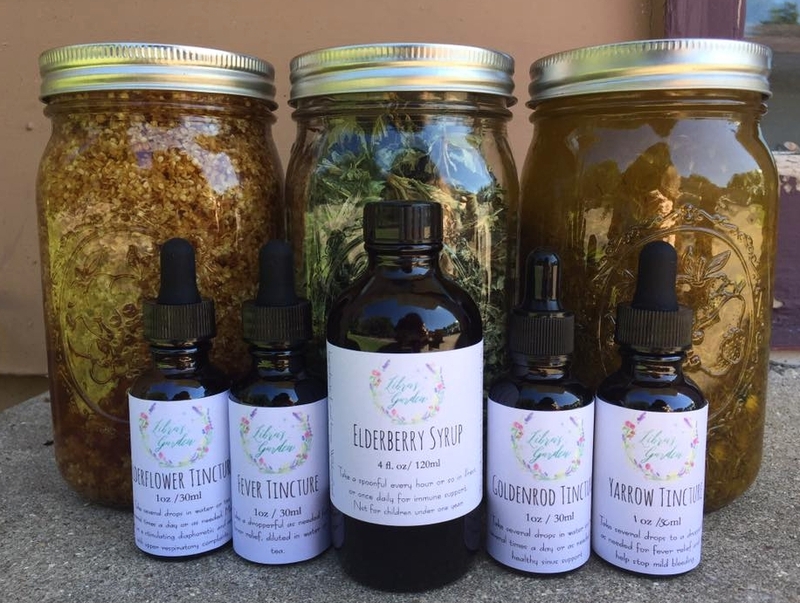 These herbal creations here are the results of much study, hours of wildcrafting and processing herbs, time spent ordering containers and designing and printing labels, and photographing to create online listings. So much work goes into these finished goods!